Is the hypernature trend a fad or set to become a major influence in bathroom and kitchen interior design? Over the past 12 months there has been an emerging trend in interiors, which has taken the philosophy of ‘bringing the outdoors in’ to the next level. Enter Hypernature, which offers super-realistic natural effects using technology to recreate the aesthetics and textures of the outdoors. Director at InHouse Malo Tasle explains: “Hypernature is an exaggerated version of nature, one that never actually existed. In fact, kitchens and bathroom spaces are arguably the key rooms in the home which most lend themselves to the hypernature trend, as they are closest to nature. Architectural projects have frequently transformed a traditional, ground floor kitchen into an open plan design which leads directly into a garden. And the bathroom allows users to directly commune with nature through their experience with water. Nolte’s regional sales manager for the South West and Wales Eddie Streader comments: “One of things that makes us feel at ease and never gets boring is the world outside, nature. Wood and the colours we’re surrounded with are timeless. Natural materials such as wood and stone have long influenced the interior styling of a kitchen or bathroom, but the use may have been restricted due to porosity or difficulty of maintenance. However, with the latest technological developments, materials such as porcelain and quartz have been created to offer the same aesthetics through carefully considered visual and textural replications. In fact, it could be argued that, through the use of tiling, kitchens and bathrooms have embraced hypernature for some time. And wall and floor coverings have been joined by work surfaces which have used cues from the natural world to create an array of interior looks from industrial through to country styling. 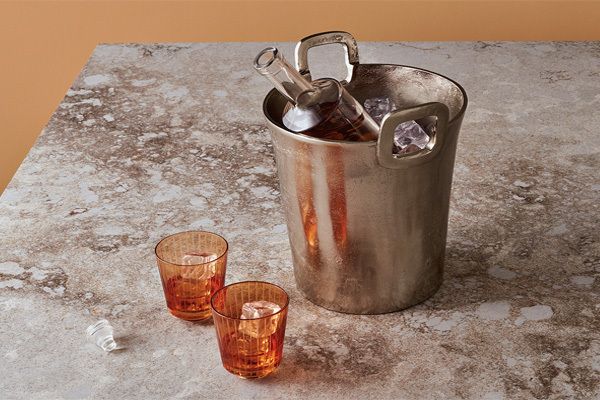 Quartz has been key to this revolution, mimicking natural stones such as granites and marbles, through to engineered versions such as concrete. 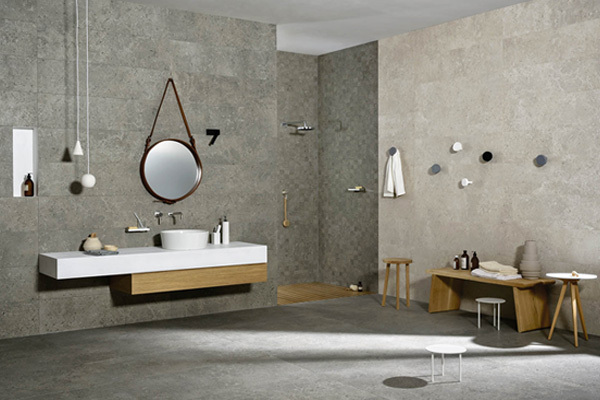 Most recently, Caesarstone extended its Metropolitan Collection with the likes of Airy Concrete and Excava. Vice president of marketing at Caesarstone UK Jon Stanley comments: “The industrial movement in contemporary interiors has led to a more robust design vocabulary. But hypernature has not just influenced the surfaces of the environment; it has now made an impact in the construction of kitchen and bathroom products too. 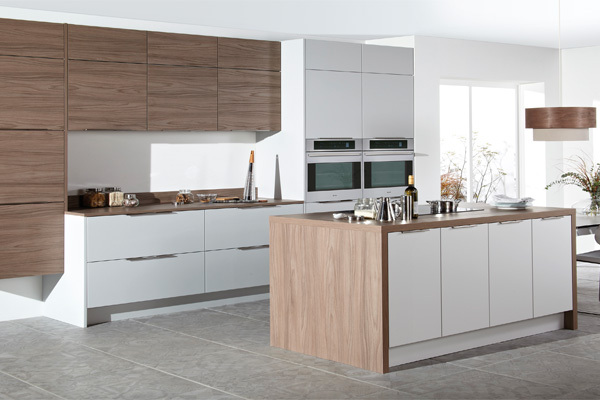 While vinyl wraps, foils and laminates which offer a wood effect for cabinetry may be nothing new, they have now been now been further engineered to enhance realism. 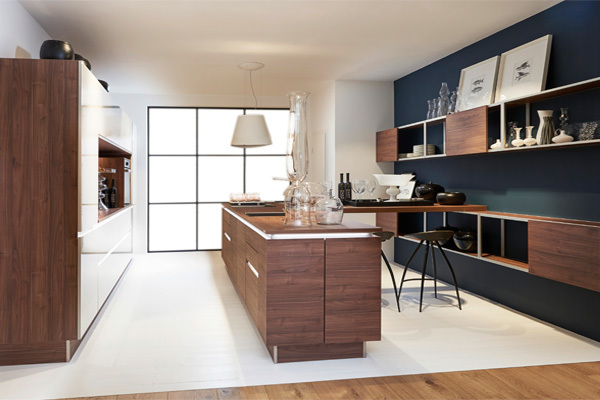 Managing director of Daval Simon Bodsworth offers the example: “Some of our kitchens are designed with the option of being finished in paint grade foil – an exclusive painted wood effect. While Nolte’s regional sales manager for the South West and Wales Eddie Streader comments that its wood-effect range is so realistic it is indistinguishable from timber: “We launched our Artwood range a couple of years back. However, examples of hypernature are not restricted to wooden decors. 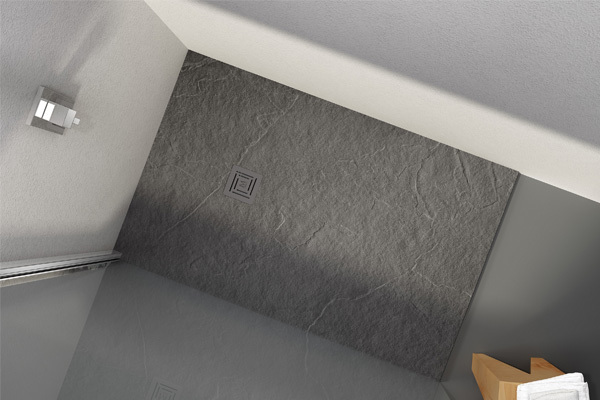 Similarly to tiles, natural and engineered stone effects are also influencing product designs. 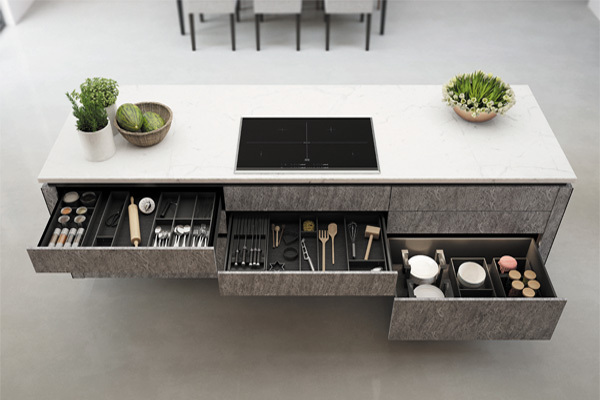 Daval introduced stone effect laminate kitchens – Langham Basalt and Slate – last year. “Each of these hypernature finishes has recently gained momentum within our portfolio, being using in complete schemes. 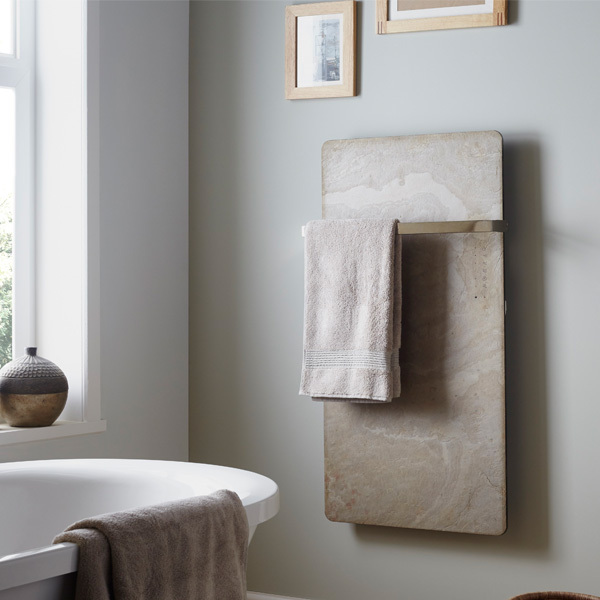 “Or, more recently, as a premium accent to other furniture styles and collections we offer.” While for the bathroom, stone effects have been used for shower trays, as well as towel warmers. In fact, it seems the industry is just at the beginning of a journey to explore the natural world for inspiration. Eddie Streader of Nolte is enthusiastic when he says: “The more realistic finishes there are to get creative with the better. 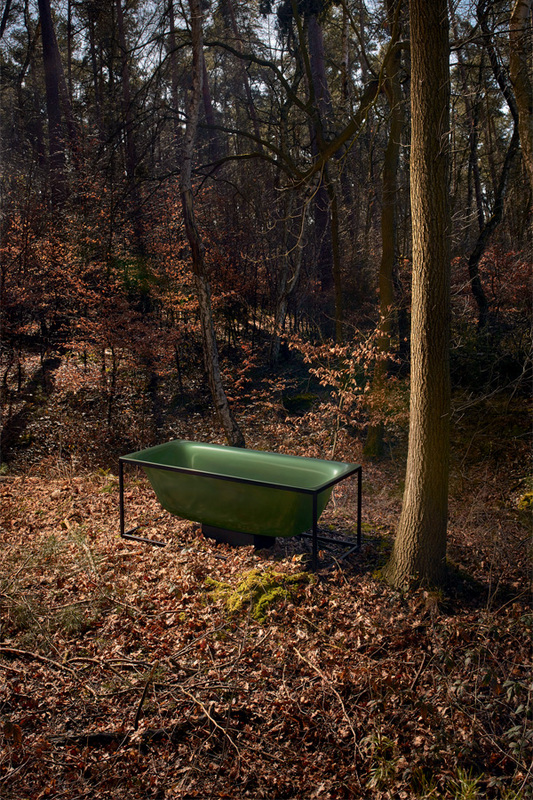 Indeed, Bette is already on the path for the next nature influence, having been inspired by ‘mother of pearl’ to create colour with optical depth for its titanium baths and washbasins. Marketing director of Bette Sven Resinghoff comments: “Shells that shimmer like mother of pearl, shiny gold insect carapaces or the glowing colours of autumn leaves – iridescent colours are found everywhere in nature. So is hypernature an interior fad, a just a whimsy of interior writers looking for the next lifestyle trend following the Scandi styling of Hygge and Lagom? And although talking about tiles, Peter Vann could be talking about the bathroom and kitchen holistically, when he concludes: “The natural effects are not solely about the aesthetic. Kitchens & Bathrooms News recently explored another growing trend: connected appliances.